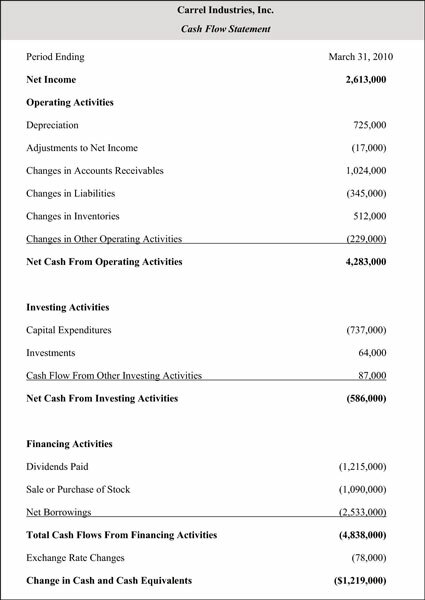 The cash flow statement is like the company’s checkbook register. It records the actual movement of all the cash in the company, showing which activities generated the money coming in and what was actually paid for in that quarter. The cash flow statement measures the movement of money from three different activities — operations, investments, and financing. Investing activities: Any money spent on the purchase of new assets such as machinery, plants, or land gets classified as a capital expenditure, or CapEx. These new assets go to the future production of income. Companies invest in capital expenditures to maintain and grow the business. Cash flow from investing activities subtracts capital expenditures from all income generated by these assets. Financing activities records the financing of the company’s operations, including the payment of dividends, the sale or purchase of stock, and the net amount the company has borrowed. Negative free cash flow doesn’t automatically mean the company is in trouble. It may be making huge investments for future earnings growth. However, it’s not a good sign for the dividend investor. Companies need to have cash on hand to pay dividends. If they don’t have enough cash on hand, they need to take on debt to make the payments or simply stop paying dividends. Borrowing funds to pay dividends isn’t sustainable, so free cash flow gives a clear look at how secure the dividend is.